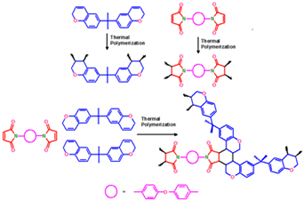 High performance thermoset resins, bispropargyl ether of bisphenol A (BPEBPA) and 4,4’-bismaleimido diphenylether (BMIE) were prepared and the structures were confirmed. Blends of BPEBPA and BMIE having different weight ratios (80:20, 60:40, 40:60, 20:80) were made and the pure monomers and blends were isothermally polymerized at 200 °C for different time intervals (0, 3, 6, 9, 12 h). The FTIR studies of the blends reveal that the addition of BMIE is not affecting very much the absorption peaks specific for BPEBPA. The onset and endset values for curing of the pure monomers and blends were affected by the isothermal curing. The endset curing temperature for the blends decreases nearly 40 °C compared to both the monomers. The enthalpy of curing for BPEBPA decreases nearly 200 J/g by the addition of 20 wt% of BMIE. The activation energy values for curing of the blends decrease compared to pure monomers.